Usually I try not to sound too preachy on this blog. It kind of goes without saying that I think that Star Wars: The Old Republic is a great game, otherwise I wouldn't still be maintaining a fan blog about it after nearly four years. 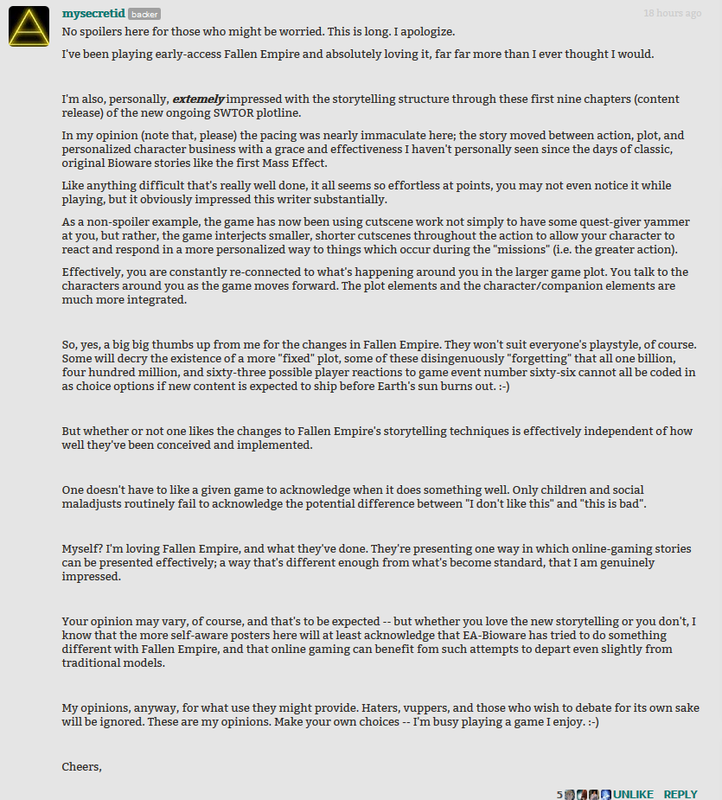 Of course there are all kinds of valid reasons to not like SWTOR, but then what are you doing here, reading a fan blog? 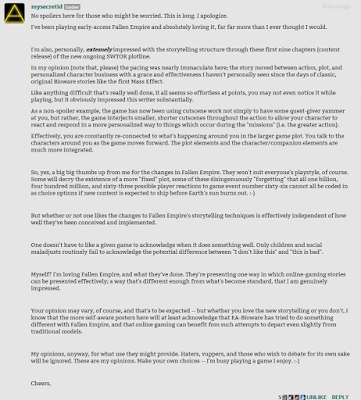 I tend to assume that I'm writing for people with a similar general mindset (even if there are always things about the game that we criticise and would like to see improved). However, every now and then I find myself wanting to address the people "at the fringes", so to speak - those who may have played the game at some point and had some fun with it, but eventually got bored or fed up with certain aspects of it. Or maybe those who like Bioware's single player RPGs and have been curious what SWTOR is all about but are scared to dive into this whole "MMO" thing. Today I would like to address those among you... because Knights of the Fallen Empire's story is totally for you, guys. Does that mean that it has no appeal to players like me, who have been playing since launch? Of course not. In fact, I think there are aspects of the plot that only long-time players will be able to fully appreciate, simply because they feature characters that you will only know if you actually played through most if not all of the different class stories. 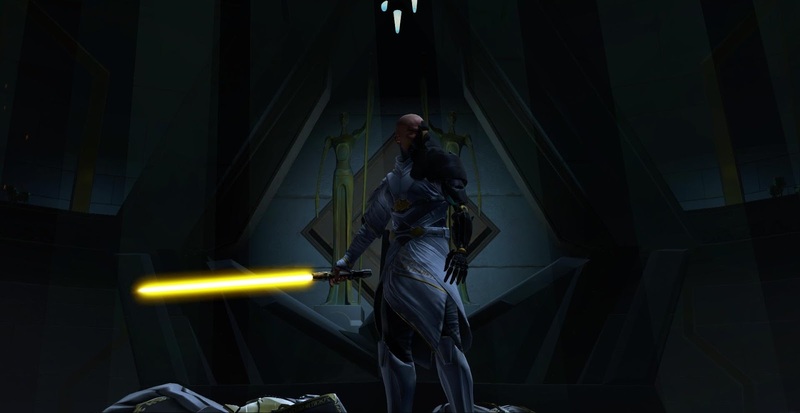 But the point is that as a long-time player, I'm someone who's been pretty happy with SWTOR as it was. Knights of the Fallen Empire was clearly made with an eye on changing some things that people like me weren't perceiving as problems but that actually kept others from enjoying the game. 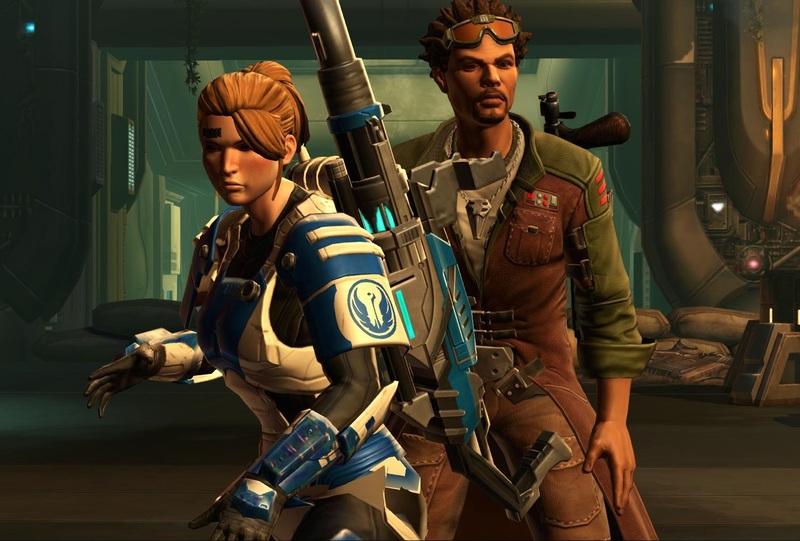 At its core, it's all about the story, as this is the one thing that SWTOR has mostly been praised for even by its critics. However, even here there were imperfections - many felt that the MMO aspects of the game were often intruding too much on the personalised story to let it flow properly. You finish an engaging conversation with your (NPC) team, but then you have to leg it halfway across a planet before they will talk to you again. Or maybe you've got to collect twenty boar nexu livers before you can proceed with the next step of the story. This isn't really a problem if you like traversing large virtual worlds and killing wildlife for its organs, but if you're really just there for the story, I can understand why it would feel like a drag. Companions feel much more part of the world around you instead of pets that follow you around everywhere. Not to mention that everything looks a lot more cinematic. The camera movements make for interesting and dynamic scenes, and all characters, including yours, seem quite a bit more expressive than they used to be. I also found it noteworthy that, in true RPG fashion, you sometimes get glimpses of things that are going on elsewhere, things that your character logically would have no way of knowing but you get to see them as a player because it adds something to your experience. This really is the KOTOR 3 that people clamoured for in the past, with the first nine chapters clocking in at about ten hours of playtime based on my own experience. If you think that's not worth a month of sub time just yet, wait until next year when they'll release some more chapters which will all be instantly accessible the moment you subscribe. But whether you're into the whole MMO aspect of the game or not, Fallen Empire is worth checking out for the story alone. Now, for those of you who've been reading my blog for a while, you may be scratching your heads at this endorsement of mine. I've been railing against people labelling SWTOR as a single player game almost since launch. It's one of the main "myths" about the game that I've been trying to dispel. And I really disliked that Shadow of Revan forced you into solo phases. How can I condone this "solofication" of what's supposed to be an MMO? 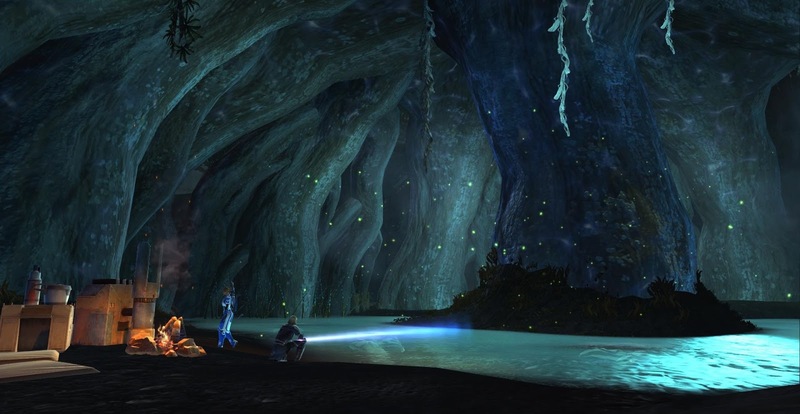 The thing is, if you look beneath the surface, very little has changed about the things that make SWTOR an MMO, and if so, they've generally become more amenable to group play, not less (that will really have to be a post of its own at some point). SWTOR has always had a large amount of single player content, namely in form of the class stories. What has changed in Fallen Empire is that the borders between your personal story and the rest of the game are marked more starkly. While playing through the original class stories, you might have had to leg it past other players killing twenty rakghouls for their side quest for example, though the class phase itself was still cut off from the rest of the world. Fallen Empire takes this principle and takes it a step further by letting most of the story take place in phase and saving you the running around in-between - I was actually startled when in chapter four, you briefly emerge into a shared area where I saw other players around me. I was never bothered by the fact that we had our "personal story" away from the rest of the world, as long as there were still other things to do as well. Shadow of Revan's personal phases bugged me because they seemed to serve little purpose from my point of view, constantly separating me from my pet tank without creating a better experience for either of us. But Knights of the Fallen Empire's story actually feels like it benefits from this treatement - it feels like a proper continuation of the class stories at last, even though the story contains only minor differences for different classes. The crucial difference to Makeb and Shadow of Revan is that it finally lives up to the standards set by the base game in terms of providing you with a personalised background for your character... and then surpasses them. TL;DR version: KotFE's story is awesome, and easily playable as a single player RPG if you don't want to deal with any of the "MMO stuff", more so than the class stories were in the base game. However, all the underlying MMO mechanics are also still there for those of us who like them; it's just that our personal story got even better. Win-win! I'm always happy to be wrong about a pessimistic prediction. "Of course there are all kinds of valid reasons to not like SWTOR, but then what are you doing here, reading a fan blog? I tend to assume that I'm writing for people with a similar general mindset (even if there are always things about the game that we criticise and would like to see improved)." I often wonder about the trolls who do show up to crap on people's fun. Good think that neither of our blogs are visible enough to worry about that sort of thing happening. I don't like the KotFE story - mainly because it's so damn involving and gripping that I keep going to bed a couple of hours after I should because I can't find a convenient place to tear myself away from it! Seriously though, this is great and I'm itching to get home and finish off the story. I'm also looking forward to taking other characters through it to find out how some of the scenes play out. At the moment, I can't imagine at all how it isn't all just an extension of my SW story. It's pretty evil how each scene and even each chapter just flows right into the next, with no real breaks. You're already half asleep at your keyboard, but you just don't... know... where to stop! Glad you're enjoying yourself! Your review makes me want to jump back in, so thank you for that. I never got very far in any of my classes, so their re-aligning of quests and your review have combined to pique my interest in finishing up the class story and moving into KotFE! First off, I'm glad you're still blogging even though I don't check out your updates as often as I should. Second, you're pretty much start on. I'm back in swtor thanks to kotfe and attempting to pick a main to play and build up alliances on, which is pretty difficult for an altoholic with characters on every US server. Seems like this will be pretty good for casual players like me, as long as they don't try to boost influence/alliances on multiple characters. Heck I've even spent hours on the outfit designer for the first time ever. May have to take another look at strongholds as well with all the new deco's I've gotten. A week of early access and I still haven't got around to starting the story yet. I am really enjoying being able to go just about anywhere, do what I like and still get some kind of reward for it. And my guild has gone ops crazy, one every night, always oversubscribed and we're having to /roll for places. Game is really fun at the moment. There will be ten people online at midnight on both sides, that time of night there is usually only one or two. My guild has been exactly the same! (My pet tank and I have this week off work, which has helped us enable the crazy.) The levels of fun and renewed energy in the game are definitely palpable. It can't stay like this, but I'll enjoy it while it lasts. Also, as I'm writing this, they are taking the servers down for an hour "to activate additional hardware to increase server capacity". Says it all really! I just picked SWTOR up again after having quit 6 months after release. I don't really know anyone who's currently playing on EU servers, and so I started over from scratch. I enjoyed my return so much that I bought a 60 day game card. Right now, my commando is level 38, the highest I have ever been in SWTOR. However, I am a bit concerned because I've been playing it like a solo game completely. Yesterday I accepted a group invite from a Jedi Knight to run Taral V with him, and had to quit at the fourth boss that we couldn't 2-man. I then ran Taral V in solo mode and had an infinitely better time than when I played with the other guy. In fact, I don't know what I would possibly do when reaching endgame, as I have no interest in the actual MMO aspects of the game (beyond selling stuff on the auction house). I think it's really tough to get into being excited about the MMO bits if you don't have a solid group you're already playing with. I hope that I can maybe convince my SO to come back because duoing with her was a lot of fun at release. I hope you'll enjoy your time in the game! They made levelling so fast now, you should easily be able to play through more than one class story in those sixty days. There are currently some... tuning issues with companions and group content. I was in a tactical flashpoint myself yesterday, where we made better progress after two people dropped out and we could summon our NPC companions instead. And I totally understand your trepidation in regards to the game's longevity if you keep focusing on the solo side of things, but is that really typical to SWTOR? If you're a new player levelling through questing in WoW, Wildstar or some other theme park MMO, don't you have to bring your own friends as well or otherwise make an effort to reach out to others? Level Syncing! So Much Love!